‘Tis the season for Christmas decorations! My family and I love this time of year. The house feels so cozy when its all aglow with twinkling lights. We trim as much of the house as possible. My children get all excited at the notion of Santa, baking cookies and snow! (We rarely get snow down here in the South.) It’s just a wonderful time of year. But as much as I enjoy it, I know there are many people who do not enjoy it. The thought of lugging the tree out of storage, or the woods, depending on preference, setting it up, decorating it and taking it all down in a month is just exhausting. And then there are others who want their tree to look like it came out of a magazine but don’t know how to do it. And still others who just don’t have the time to mess with it. I understand all of you, whichever category you fall in to. I have some very simple tips that I follow and I will share them with you. 1. Keep in simple. Some of you are not going to like this, but I have a fake tree. A 7′, pre-lit stunner that I spent a fortune on. It is an investment, but I waited until very close to Christmas, got it for 30% off and it has a 10 year warranty. There are 800 twinkling lights already in place. If a light goes out or it malfunctions in any way, I take it back and get a replacement. It stores easily in a bag in the attic and goes together in 5 minutes. I light a Yankee Candle Balsam and Cedar scented candle and you could swear I have a real tree in the house! Simple. 2. Choose just 3 colors. That’s my rule for ornaments. My tree is green, white and red. I only use white lights. You can use any 3 colors. For a coastal look use blue, white and silver. For a woodsy look use brown, red and white. Think snow, burlap and cardinals. 3. Theme-less is timeless. Nobody says that your tree has to have a theme. Glass ornaments do the trick. You can buy them by the dozen in all different shapes and sizes and colors. Glass ornaments never go out of style. I use glass ornaments all over the house. I have bowl of them just sitting on the kitchen table as decoration. My tree has tons. I have been known to even hang them from chandeliers. And since they are so affordable, I don’t cry if one breaks. 4. Don’t be too type A. Coming from me, that is quite a statement because “Type A” is my middle name. But seriously, your tree should be a reflection of you and your family. It’s a time to celebrate each other, our blessings and our love. 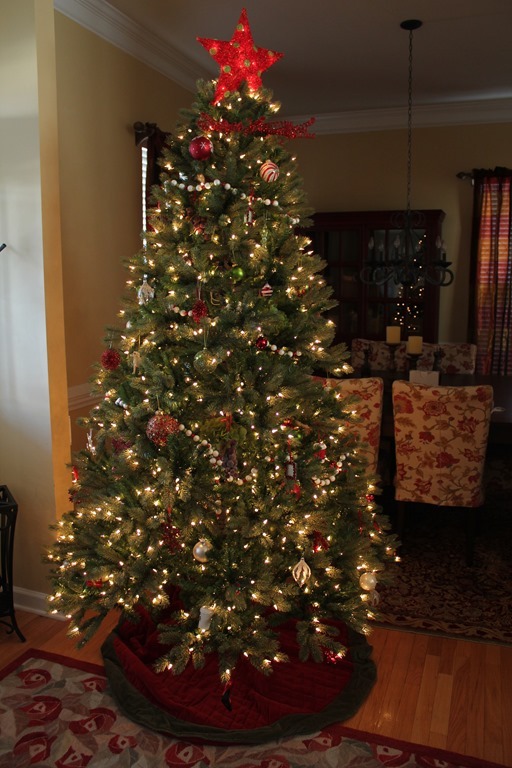 Enjoy trimming the tree together and it doesn’t have to be perfect. It should just make you all smile. I hope y’all had a wonderful Thanksgiving! I did not host Thanksgiving dinner so I don’t have any left over turkey to work with so this weeks menu is turkey free. I am on detox this week from all the wine and food consumed over the holiday. Time to reset the old body clock. 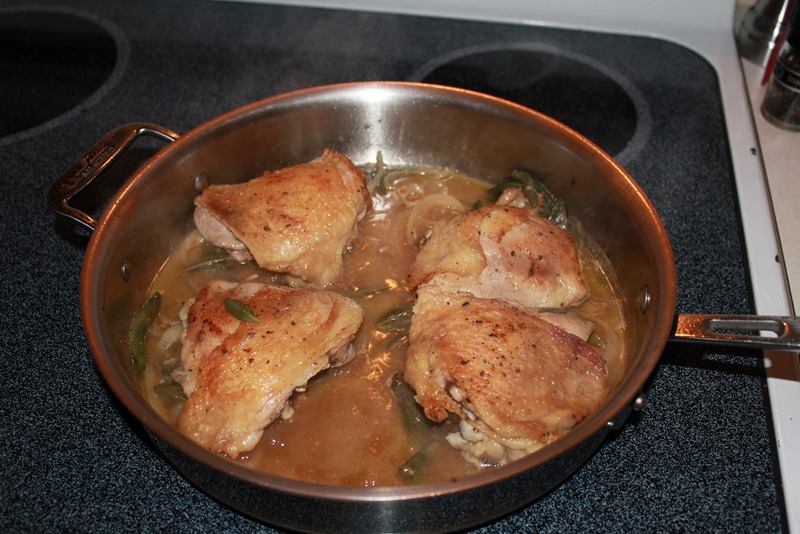 Rinse and pat dry the chicken thighs. Salt and pepper both sides. Melt butter in a Dutch oven over medium high heat. Add chicken thighs and brown on both sides. Once both are browned, leave skins side up. Add onion, garlic and sage. Sauté for 1 –2 minutes. Reduce heat to medium. Add wine and broth. Stir and cover for 30 min. It was actually pretty good. My son and husband both asked for seconds. 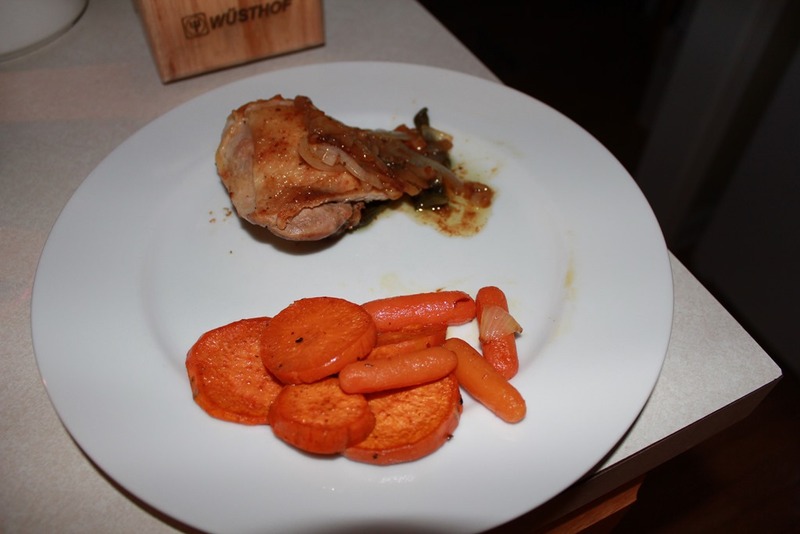 I served it with roasted carrots and sweet potato in a maple syrup glaze. By glaze, I mean drizzled over the top. I do what I can. Happy Thanksgiving! I wish everyone safe travels and enjoying their family! I am thankful that you are reading my blog. This weeks meals were planned with warm, coziness in mind. I wanted some yummy comfort food but I’m on a lower carb kick. I want to begin to fend off the holiday bulge before it begins! It’s another wonderful fall day. Yesterday was spent watching football, playing football and eating some wings with friends. I planned this menu with some savory fall meals. I love fall because the food can be cozier and a bit heavier. I enjoy all of the flavors of fall – apple, maple, cream, bacon. Yum! Thursday – Beef Bourginonne Barefoot Contessa style! Here is my awesome Autumn Meat Loaf recipe. My 6 year old actually cheered when I told him that this is what’s for dinner. Preheat oven to 400 degrees. Mix stuffing and the milk until moist. Add all the other ingredients except the bacon and mix until well combined. I use my hands to do this. Form mixture into a loaf or pack into a loaf pan. Lay bacon over the top and bake for 45 min. to an hour. Voila! Bon Appetit! Halloween is over and November is here! Can you believe it?! In 3 weeks we will be sitting around a table with our family and a turkey. For now, Halloween is over and the decorations must come down. That means that we are in the décor “lame duck” period. It’s too early for Christmas decorations, but we can’t leave Halloween up because its over. So I’ve been looking for some inspiration. Here is what I’ve stumbled upon. Lots and lots of pumpkins! Photo courtesy of Southern Living. Super orange hues. 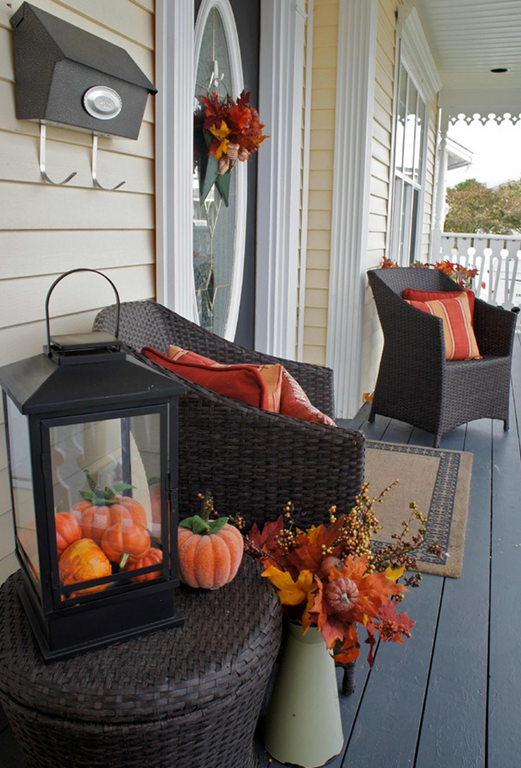 Photo courtesy of Houzz. Leaves and hay make a beautiful harvest theme. I love the walnuts in the candle holders! Photo from google. I’ll post what I come up with. Now comes the task of taking down the Halloween Décor while my kiddos aren’t home. Oh, the heartbreak!